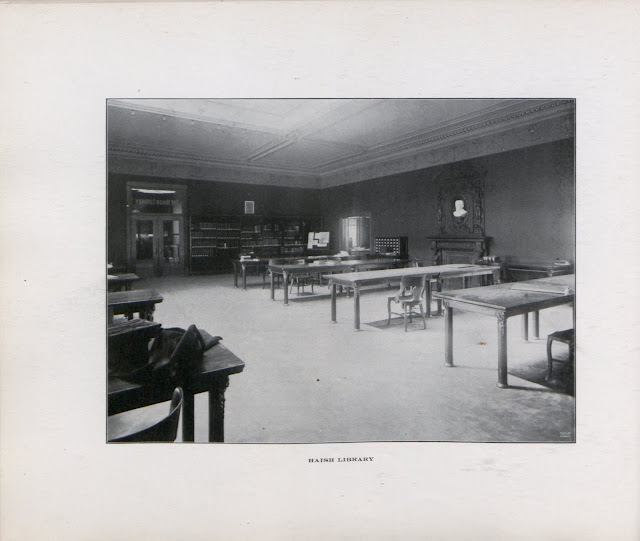 The Haish Library, in Altgeld Hall, as pictured in the 1900 edition of the "Norther," the school yearbook. In 1895, Jacob Haish donated $10,000 for construction of a library at the Northern Illinois State Normal School, now known as Northern Illinois University. 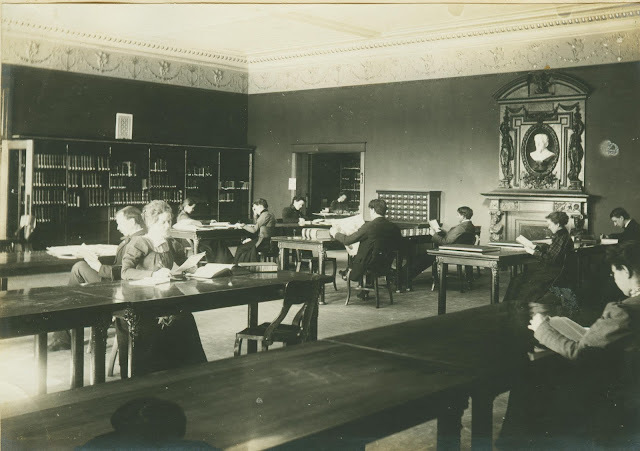 The library, seen in images below, was originally in Altgeld Hall, or the "castle" of NIU. The college library was called the "Haish Library," not to be confused with the city library, the Haish Memorial Library, which was constructed after Haish's death. According to documentation in the Ellwood House Visitor's Center, "this money was used to acquire almost 6,000 books during the library's first year of operation. By 1952, the library outgrew its space in Altgeld Hall and was moved to Swen Parson Hall. Once again, outgrowing the space, the 314,000 square-foot Founders Memorial Library was constructed." A Daily Chronicle article, reprinted in a 1926 edition, stated: "Mr. Haish's gift was the nucleus of a library that is on a par with the libraries in the other four state colleges of the state ... Mr. Haish was a lover of books and wished others to realize the same joy. In giving the money for a library at the college he realized that he would afford students the opportunity of using books that they might not otherwise have been able to secure." One piece of history was lost somewhere along the way, however. The white bust of Haish, seen in these images of the library, was somehow lost in transition from building to building, according to multiple local historians. The eventual outcome of the bust is unknown. According to the same Daily Chronicle article, "the bust is a perfect likeness of the great man and is so located in the large room that it commands the attention of all who enter."